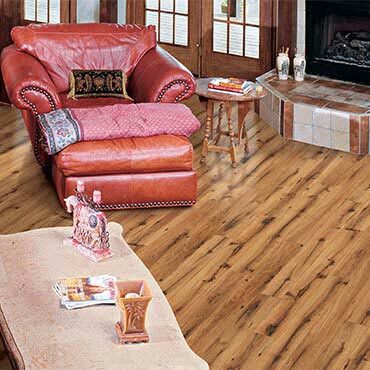 Kronotex Laminate Flooring is one of the largest manufacturers in the world, offering a comprehensive collection of attractive, adhesive-free laminate flooring systems. Customers are realizing the value of Kronotex laminate flooring... a winning formula of style, high quality German engineering, affordability, and a growing network of customer service. Very suitable for installation over warm water underfloor heating. Is consistent... our factory literally takes in the raw wood and ships out the finished product, with total control over the entire manufacturing process. With the Clic system, you have purchased a product that is installed without glue, quickly and problem-free. The specially developed tongue and groove joint makes it possible to snap the individual panels together with a single “click“. Once joined, the panels form a fixed unit. All edges are protected against the absorption of moisture by an environmentally friendly hydrophobic agent. But the snap-in connections are as easily separated as they are installed, whenever you wish to re-install the product in another location or introduce further individual panels with a different decoration or different design elements into your space. You can load or walk upon the finished section immediately. When you install Clic in a furnished apartment, the furniture must simply be moved away from the working area, not from the room. After installing the first rows, everything can immediately be placed back upon the finished portion. As a natural product it creates a healthy and environmentally friendly atmosphere. For the manufacture of its core structure, they only use freshly cut trunks of pine from the immediate vicinity of their factory. These are a normal product of forest management, so that we are contributing to the eco-friendly use of the forests. All production procedures are subject to the strictest environmental regulations and controls. In this way, they can guarantee that only natural and environmentally friendly materials are used. The wood component of their products is 80 to 85% of the dry material. They do not use harmful substances like halogens, heavy metals, chlorides, PVC, PCB or dioxins. Thus, their product is extremely health-friendly and, after a lifetime's use, can be disposed of as normal household refuse.